10BEST Readers' Choice Travel Awards promoted by USA TODAY has nominated "Queen of the Cowtowns" for "Best Historic Small Town." DODGE CITY, KANSAS, UNITED STATES, April 16, 2019 /EINPresswire.com/ -- As the 2019 tourism season kicks off in Dodge City, Kansas, USA Today notified the Dodge City Convention & Visitors Bureau that Dodge City is in the running for the “2019 10Best Readers’ Choice Travel Awards”, (promoted by USA TODAY) in the category of “Best Historic Small Town.” Dodge City is known for its 19th century wild west history and continues to appeal to visitors by preserving this culture throughout the community. Visitors can enjoy the Boot Hill Museum which is located at the original site of the Boot Hill grave site and contains nearly 30,000 artifacts from the old west. On top of the Hill, you can find the Boot Hill Distillery which will give you the ultimate “Soil to Sip” experience. Located in the 1929 restored city municipal building, the Distillery conducts tours daily during the summer. Be sure to take a historical trolley tour! 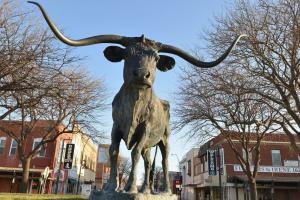 The tour will provide you with the history of Dodge City, and some facts that only the ‘locals’ know! The western heritage theme continues in the city with the Longbranch Lagoon Water Park, the Boot Hill Casino and Resort, and the Kansas Teachers’ Hall of Fame and Gunfighter’s Wax Museum. 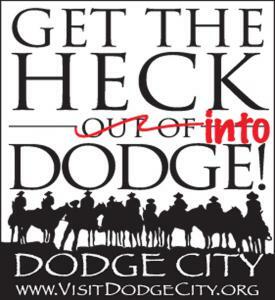 Experience our western history with Kansas’ second largest community festival – “Dodge City Day.” This summertime festival hosts several activities throughout the ten days including a BBQ contest, a western parade, concerts, cattle drive, and the USA Today's # 1 Rodeo in 2018, the Dodge City Roundup ‘PRCA’ Rodeo. With all this rich western history and so much more, it’s no wonder that Dodge City has been nominated for the second year in a row for the “Best Historic Small Town.” Dodge City’s summer season will kick off Memorial Day weekend and run through Labor Day with gunfights, can-can dances, and sarsaparilla. Find out more about Dodge City’s history and activities at www.visitdodgecity.org or request information by calling 1-800-OLD–WEST. Don’t forget to vote for Dodge City DAILY until May 6th at https://www.10best.com/awards/travel/best-historic-small-town/dodge-city-kansas/.